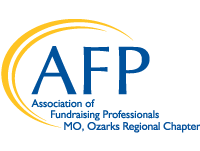 Join us on Facebook at https://www.facebook.com/AfpOzarksRegion/ for great conversation, photos and job postings! Contact: President, Millie Schuchmann, Development Coordinator at Isabel's House at 417-718-2013 or millies@isabelshouse.org. For Job Postings, please email Millie Schuchmann (above) or Katy Spencer (kspencer001@drury.edu) a PDF/Word Document format posting with link to your hiring website. Once you hire for the position, please inform us so the posting can be removed.